Tehillim, with Rashi commentary and Amarot Tehorot commentary by R. Eliezer Horowitz Rabbi of Tarnogród, disciple of R. Yechiel Michel of Zlotchov (Zolochiv) and of R. Elimelech of Leżajsk. Zhitomir: R. Chanina Lipa and R. Yehoshua Heshel Shapira 1857. Two title pages. Bound with: Seder Maamadot and Seder Ketoret according to the Rabbi of Apta (Opatów). Zhitomir: R. Chanina Lipa and R. Yehoshua Heschel Shapira, 1857. A LaMenatze'ach Menorah appears on the last leaf, with sections of prayers and segulot. The Amarot Tehorot commentary is the first Chassidic commentary printed on the Book of Tehillim (first published in Warsaw, 1839), authored by R. Eliezer of Horowitz (Hořovice, d. 1806, Encyclopedia L'Chassidut, I, 257-259), Rabbi of Tarnogród. A descendant of the Shelah, he was the disciple of R. Yechiel Michel of Zlotchov and of R. Elimelech of Leżajsk, and disciple-colleague of the Chozeh of Lublin and the Maggid of Kozienice. He also authored Noam Megadim UKavod HaTorah. Stamp on second title page: "Shalom son of R. Natan Nota shochet and bodek here in Berdychiv". Tehillim: 8, 5-438 pages. Maamadot: 64 pages. 22 cm. Light-colored high-quality paper. Good condition. Stains. Wear and dampstains to title page and to a few other leaves. Creases to several leaves. Small closed tear to one leaf, repaired with tape. Minor damage to one leaf with small loss of text. Stamps. New leather binding. This 1857 edition is not listed in the Bibliography of the Hebrew Book. 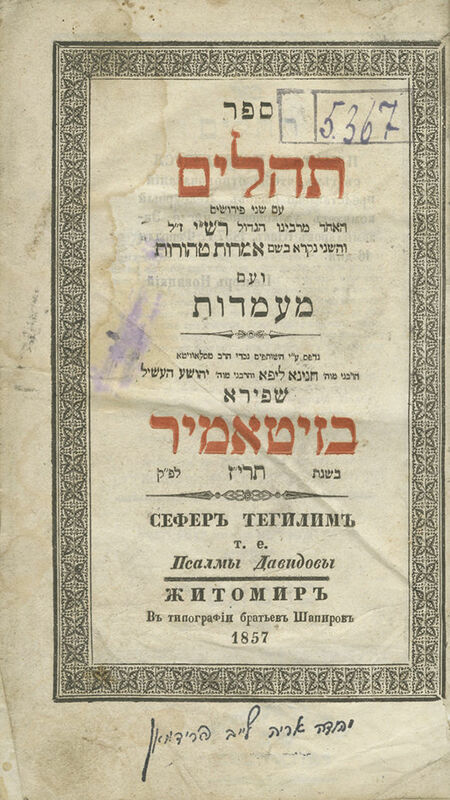 Listing 0305437 records another edition of Tehillim printed in Zhitomir in 1855. This listing does not mention leaves 214-219 with indexes to the book Amarot Tehorot existing in this copy (see Kedem Auction 49, item 13).